February 9, 2011: NASA is about to discover how solar heat devours a comet. "For the first time, we'll see the same comet before and after its closest approach to the sun," explains Joe Veverka, principal investigator for NASA's Stardust-NExT mission. The comet is Tempel 1, which NASA's Deep Impact probe visited in 2005. Now another NASA spacecraft, Stardust-NExT, is closing in for a second look on Valentine's Day, Feb. 14, 2011. The two visits bracket one complete orbit of the comet around the sun--and a blast of solar heat. "Close encounters with the sun never go well for a comet," says Veverka. "Fierce solar heat vaporizes the ices in the comet's core, causing it to spit dust and spout gas. The cyclic loss of material eventually leads to its demise." Researchers suspect the flamboyant decay doesn't happen evenly all over a comet's surface*, but until now they've lacked a way to document where, exactly, it does occur. 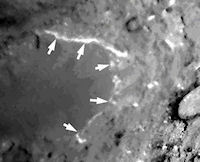 Stardust NExT will image some of the same surface areas Deep Impact photographed 6 years ago, revealing how these areas have changed and where material has been lost. "Deep Impact gave us tantalizing glimpses of Temple 1," says Veverka. "And we saw strange and unusual things we'd like a closer look at." 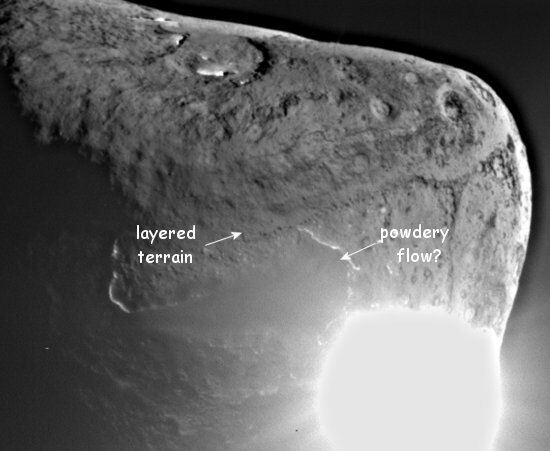 For starters, parts of the comet's surface are layered like pancakes. "Earth has layers because water and wind move dirt and debris around here, but layering on a comet was a surprise – and a mystery," says Veverka. "One idea is that two protocometary bodies collided at low speeds and smushed together to form something like a stack of flapjacks," says Pete Shultz, Stardust-NExT co-investigator. Is that right? Data obtained by Stardust-NExT will provide clues and possibly reveal what made the "comet pancakes." Another area intrigues the research team even more. "There's a large plateau that looks like a flow," says Shultz. "If it really is a flow, it means there was recently gas and dust emanating from the [surface]." Stardust-NExT will reveal how the plateau has changed (Is it flowing? ), helping the team determine its origin. Whatever their origin, the plateau and layering show that comets have a much more complicated geologic history than previously thought. "Tempel 1 is not just a fuzzy ball," says Shultz. "It has history." It's a history NASA has had a hand in. During its 2005 visit, Deep Impact dropped an 820-pound projectile into the comet's core. In a development that surprised mission scientists, the impact excavated so much material that the underlying crater was hidden from view. 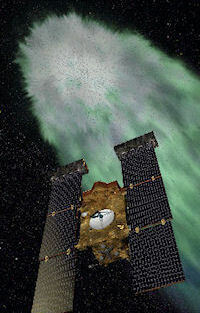 Deep Impact's cameras were unable to see through the enormous cloud of dust the impactor had stirred up. Stardust NExT could provide a long anticipated look at the impact site. "The dust has settled there, so if the right part of the comet is facing us, we could see the crater and learn its size," says Veverka. "That would answer some key questions. For instance, is a comet's surface hard or soft?" In a future mission, a spacecraft may land on a comet and gather samples for analysis. To design a suitable lander, researchers need to know what kind of surface it would land on. They'll also need to know which tools to send – drills for hard surfaces or scoops for something softer. "We could have just let this old spacecraft rest on those laurels, leaving it to forever orbit the sun," says Veverka. "But instead, we're doing first-class comet science with it -- again." As for Tempel 1, a hungry sun awaits. Stardust-NExT: A Comet "Before and After"
*Scientists estimate that a comet's surface is diminished an average of 5 to 6 feet of during each "date" with the sun, and the loss is not uniform. "Typically only 10 to 20 percent of a comet's surface is active, so those areas could lose as much as 50 to 60 feet," explains Veverka. "That means comets are not uniform on the inside either – some places are icier, some rockier."